Increased Epidemiological appearances with high virulence danger (SARS, Asian flues, Cholera, Variola, Bioterror Agents, etc) requires increased intervention mobility directly in the infected areas, while respecting Biosafety rules and protecting fixed labs and facilities. One of the WHO priorities in the 3-rd Millennium is to improve and promote essential Health technologies applicable at the primary health care level. 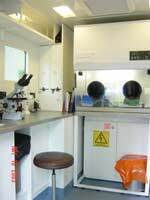 The Strategy of the ORLANDO group is also to implement a Programme for training of the laboratory technologists and technicians for these Mobile Medical Laboratories, in the spirit of Good Laboratory Practice and Quality Assurance, up to BSL3 level. Such training can be accomplished in Hungary or Romania in a high level training, approved facility. Some of the Identifiable diseases are: SARS, HIV, Variola, Malaria, Cholera, Tuberculosis, Polio, West Nile , Hepatitis, Anthrax, Ebola, Botullinic Toxin, etc. Control of epidemic conditions like SARS, as far as human or animal farm infections are fully considered as part of this project, started in November 2001. The present requirements for protections re SARS (as of April 27 th , 2003 and 2004) are met. Avian flu H types are also considered. 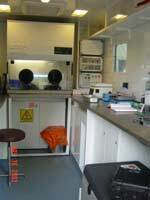 Mobile Medical and BIOLOGICAL laboratories are of great use in Epidemiological or Bioterror situations requiring Biosafety in sample collection and analysis.